PowerLogix is the only manufacturer of a next generation G3 750FX processor upgrade for the "Pismo" PowerBook G3. The Blue Chip G3 "Pismo" for PowerBook G3 FireWire (a.k.a. "Pismo") laptops provides the processing power of the PowerPC 750FX G3 chip to give your Pismo never before seen performance for a fraction of the cost of a new PowerBook G4. Tests show the BlueChip G3 "Pismo" 800 even outperforms the G4 500 MHz upgrade in many applications not recognizing AltiVec by nearly 2:1. The BlueChip G3 "Pismo" upgrades your G3/400 or G3/500 to a G3/800. You must send your processor daughtercard to PowerLogix, where your CPU is swapped. This special remanufacturing process is handled by an Austin firm known around the world as experts in this process. PowerLogix supplies a shipping container and pays for inbound and outbound freight (USA and Canada only; international freight is additional). You must have a working CPU module in your machine prior to ordering. If your current processor card is experiencing cache issues, the G3/800 may solve your problems, as the previous cache chips are disabled with the introduction of the on-chip cache. Turnaround from the day PowerLogix receives your CPU card is 5 business days or less. Note: This process will technically void any AppleCare warranty. In the case of warranty service, PowerLogix warrants the processor card. Apple service techs are trained to do module exchanges, not chip swaps. In practice, AppleCare warranty service other than the processor card should not be affected, but PowerLogix cannot guarantee this. Your iBook is an indispensable tool. Compact and powerful, it leaves little to be desired when you are on the road. But back in the office, it's nice to have the full size keyboard, monitor, mouse, network connections, and other peripherals associated with a desktop computer. The iBookEndz Dock allows your iBook to be used in that environment without the time consuming task of individually attaching each device. Simply slide the iBookEndz dock into the iBook, and you're done. You can check it out at Small Dog Electronics (go to the iBook page). 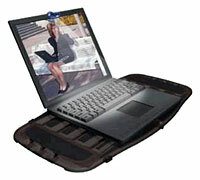 Shinza.com has announced the immediate availability of two new cases for the Titanium PowerBook G4. excellent match with the elegant design of the PowerBook G4. Each case is hand made from 100% brushed aluminum, making each case truly one-of-a-kind. The svelte, low-profile design means the case is scarcely larger than the PowerBook G4 itself. This case features a sturdy metal handle, and the interior is lined with soft protective felt and features shock-absorbing resistance pads along the edges. The TiBook Case also comes with two keys that can be used to securely lock down your PowerBook during transport. The TiBook Case is also available in a clear model that features a top lid composed of 100% transparent fiberglass in order to prominently display your PowerBook. It is often handy to be able to toss a PowerBook into a large backpack, briefcase, or suitcase. With the dust and grime that accumulates in these kinds of carrying cases, however, extra protection is essential. Putting your TiBook in the TiBook Sleeve before heading out will protect your computer from the everyday grime that accumulates in larger bags and backpacks. It also features two convenient CD-sized pockets on the back of the case. A perfectly snug fit with the PowerBook Titanium G4, this lightweight slipcase also fits other large screen notebooks - up to 15.1" diagonal - with thin profiles of less than 1.4" / 35mm in thickness. Extra padding on all sides of the notebook provide protection against shock and scratch damage. The TiBook Case is available now in limited quantities from Shinza.com for $199. The TiBook Sleeve is also available now at Shinza.com for $24.95. Protect your iBook or PowerBook G4 with iSkin. Available for iBook (white) and PowerBook G4 Titanium (667 MHz and faster) - US keyboard layout only. iSkin protects your iBook or PowerBook G4 against everyday hazards caused by spills, dirt, crumbs, and other unwanted elements that may get in between the keys. iSkin is precisely molded to protect your keyboard by creating a molded silicone layer above your keyboard keys. The iSkin keyboard protector also helps protect your iBook or PowerBook's screen by reducing the occurrence of screen staining caused by finger oils and dirt particles. The iSkin keyboard protector can be cleaned by either wiping with a damp cloth or by washing in a mild soap solution. Washing will remove any oils and build up that may occur over time. Washing does not affect the durability or protective qualities of the iSkin protector. The iSkin Keyboard Protector is available in six colors known as Skin Tones. Skin Tones add a tint of color to iBook keyboards. Colors include Blue Mist (light blue), Bubble Gum (light pink), Creamsicle (light orange), Lemonade (light yellow), LimeLight (light green), or without color as White Frost (frosted clear). Timbuk2 has added a new size of laptop sleeve - that well-padded little unit that allows you to take your work along with you whenever and wherever you go. The XXL sleeve is specially fit for Apple's new 17" PowerBook. If it's another Apple laptop you're toting around, Timbuk2's small sleeve fits Apple's 12" iBook, our medium sleeve fits the 14" screen iBook, and our XL size is designed for the Titanium G4. Keep your cool, wherever you are stuffy meetings, crowded airplanes, and even taxis in Texas won't wilt you anymore. The FlyFan plugs into a USB port to provide a steady stream of cool air - without draining your battery. Dimensions 2.6" x 11.0" x 0.5"
FlyFan USB Fan is backed by the Kensington 1-year warranty. See the keys--light where you want it Your presentation in a darkened boardroom will have more impact now, because you can actually see your laptop's keyboard rather than guessing (and missing) the right keys to hit. The gentle illumination of the FlyLight won't drain your battery or disturb others. FlyLight is backed by the Kensington 5-Year Warranty and free technical support. The Nite Key Lite from LapWorks plugs into the USB port of a laptop and provides a soft white light for the keyboard. An 18-inch flexible cable allows it to be positioned above or to the side, and the LED lights have an estimated life of up to 8,000 hours. The Nite Key Lite sells for $19.95. Founded in 1998, RadTech is an award-winning provider of digital solutions to the medical community. The company's large and growing client base also provides the perfect evaluation and testing environment for the development of practical and innovative hardware enhancements that improve the usefulness and life span of portable computers in the real world. RadTech has been involved in creating Mac-based solutions for medicine and research for three years. They've been ruggedizing Macintosh notebooks for demanding medical clients and now offer their solutions to the community at large. In the few short months since RadTech began this venture, they have shipped thousands of tools to PowerBook users the world over. PowerSleevz: Ultra light, elegant, formfitting sleevecase start at $22. Coming soon: Last Stand, a laptop computer stand with five levels of inclination and keyboard storage. FireWire Depot announces the arrival of FireDino - run for the hills!! Want a new functional conversation piece on your desktop? FireDino is a 4-port FireWire hub/repeater that is Godzilla's smaller cousin. FireDino is as menacing as he is useful as he helps to rid computer desktops of FireWire cable clutter and provide additional FireWire ports. FireDino's piercing red eyes and blue mouth light up when plugged into a FireWire powered bus on your computer or use the optional external power supply. FireDino features four fast 400 Mbps data ports designed to expand your computers FireWire capabilities. FireDino is 100% 1394/FireWire compliant and requires no additional drivers. FireDino is completely bus-powered; however an optional power adapter is available for users who may need additional power.